Remember last week when I took a sip of dish soap thinking that it was my bottle of water? Well, I totally feel like I should do that today. Not only for saying the “s” word on a Friday, but also because after yesterday I can’t stop thinking about brown butter. Or Ryan Gosling. Or Ryan Gosling drenched in brown butter. I’ve never actually had a panzanella salad. This one time at band camp about four years ago I got really, really sick… I had done an insane upper body workout at the gym which led to me not being able to lift my arms over my head for one week straight (no lie) which then turned into a sinus infection which then turned into strept throat which then led me to wake up on the couch in a cold sweat at 4AM, weeping from pain and shuffling out to the kitchen to down some Advil since SOMEHOW there were nails scraping the back of my mouth. So I took the Advil but my throat was so messed up that the ADVIL GOT LODGED INSIDE MY THROAT. I could still swallow, but it was stuck there and I could feel it which led to me having a massive panic attack and screaming on the kitchen floor, flipping out assuming I was going to die and making my mom call the doctor who assured her that if I could swallow I was FINE. Then the next day I had to get blood taken and I could still feel the pill in my throat and the minute I saw the nurse I’m all “OMG I have a pill stuck in my throat” and she didn’t really believe me or think it was a big deal, and then six months later when I got blood taken again I had the same nurse and she said “aw, you’re the girl who thought she had a gel capsule lodged in her throat! I guess you’re all better now,” to which I replied “um, no. That’s all very relevant (or not) because while I was “becoming one” with the couch that week I was sick, I watched Rachael Ray make a panzanella salad. Then I went stir crazy and flipped out on my mom and was all “why didn’t YOU ever make a panzanella salad? God, why can’t we just be Italian? There is so much good food I’ve been deprived of!” Then I wailed for about 30 minutes before passing out for the next three days, which was probably the best thing that’s ever happened to my relationship because Mr. How Sweet witnessed my true colors that week. Imagine when I woke up and was miraculously healed! Needless to say… I never made that panzanella salad. I don’t even know what’s in a panzanella salad. What makes it so special? I’m sure I did this wrong. Is it just a panzanella salad because it has bread? Oh well… it is now. I ate this for lunch this week. Want to know why? I’m sure you’re dyyyying to know because my life is so interesting. Really. I’m going on week three of playing single lady and while I secretly (or… not so secretly) freaking love it, it’s starting to make me lose my mahrbles. That’s “marbles.” Said with an “h” in it. ‘Case you didn’t get it. A positive? There has been a nice lack of Dallas Cowboy Cheerleaders plastered on my TV screen. A negative? Phone calls at 12:30AM regarding the “benefits” of Beavis and Butthead being back on MTV. I’ll never be sold on that. Oh. Sure! I’ll make this entire meal filled with beer and butter and bacon and butter and cheese. Sounds good! Because we aren’t approaching the holiday season or anything. Because it’s not like we bought Halloween candy last week (the big bars, of course) and I accidentally on purpose tore in to it… on Monday. Maybe afterwards we can go take our blood pressure, get a stress test and check our cholesterol levels? Cool. In his defense, he didn’t really use all those words like “pretty please.” He’s much cooler than that. And I swear he didn’t pay me to say that with a new pair of heels or anything. Definitely not. Preheat oven to 350 degrees F. Mix salt, pepper, chili powder, cinnamon, and garlic powder in a small bowl. In a large bowl, mix sweet potato and squash chunks, then drizzle 1 tablespoon of olive oil on top and mix to coat with your hands. Add about 3/4 of the spice mixture, and mix again to coat. Lay on a baking sheet and bake for 20 minutes, flipping once. After 20 minutes, toss apple chunks with remaining spice mixture. Add apple to the baking sheet and bake for another 25 minutes, tossing once or twice. Let squash, potatoes and apple cool, then add bread chunks to the baking sheet. Bake for 10-12 minutes, or until golden and crispy. Drizzle with a bit of olive oil if desired. 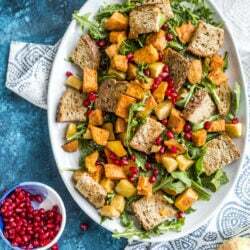 In a large bowl, combine arugula with roasted fruit, veg and bread cubes. Toss with about 1/4 cup of dressing (or more/less) then sprinkle with pom arils. Serve immediately. Combine mustard, honey, pom juice, vinegar, salt, pepper and nutmeg in a bowl and whisk. Stream in olive oil while constantly whisking until dressing emulsifies. Store in the fridge for up to 2 weeks. Now you see why I needed all those pictures. I had a lot to say. Hmmpf. One More Beauty Product I Love. 12 Favorite Fall Recipes… From Last Year. Well this salad looks so good. And I am a huge fan of pomegranate seeds. There is just something about them that is delicious :). Also, salad aside I loved the pre-recipe gym, sickness pill-lodging rant. Definately made me laugh a bit. But sounds like an interesting few weeks. This salad looks awesome! I’ve only had traditional panzanella before. You should definitely try making it in the summer when tomatoes are in season – I know you hate vegetables but it’s one of the most delicious things you’ll ever eat! This salad looks great! I’m definitely a fan of putting bread in ANYTHING! I also wanted to let you know that I made you beer bbq chicken last night and your bourbon chicken last week and both were to die for! Your chicken recipes are AMAZING. You have seriously taught me how to perfect cooking chicken. I started off with roasting them (following your directions) and then tried your crispy and crunchy recipes, and now they are staples! By boyfriend even exclaims that he thinks I cook the best chicken ever, and its all because of your recipes! Plus you have also taught me how to make foolproof chili (I have made your 5 step chili and hope when I get a little extra cash I hope to make your Hearty Chili). And I am NEVER making any other cornbread other than your brown butter one. Its perfection. Thanks again Jessica for always coming through with amazing and tasty recipes! I am also going to make your Chewy Pumpkin Chocolate Chip Cookies for a halloween party this weekend (the ones with pumpkin butter…mmm) and then I think beer mac and cheese is in order, with a side of bacon brussels sprouts! i love that you made a Winter panzanella! Panzanella is by far my most favorite summer salad – i love the idea of translating that year round! Gorgeous! sounds like you have a busy day today! this salad looks delish… i’ll have to make it soon. i just discovered that there is a pomegranate red wine vinegar (i love it) & i think it’d be perfect for this :) have a great weekend with your man! ok I just found next week’s lunch! This looks divine!! Perfectly fall! This has a few veggies, you are letting down our fans. Looks delicious! Haha … i was half expecting to see a picture of some shoes after your comment about him not paying you to say that with a new pair of shoes. Not even a pair of shoes up front and center, but as a backdrop for the food. You should write a book- enough said :) I love panzanella salad- mostly because it gives you an excuse to basically eat a bowl of croutons and veggies. I’m in! Is it ok to admit that I laughed during that whole story? hahahah! Thanks for sharing! Great story and salad! Love your site..your pictures are always so beautiful! Love this! So healthy too! This is a gorgeous salad….your pictures are so pretty. I’m Italian and I don’t even know for sure if a panzanella salad is so just because of the bread, but that’s what I’ve always just assumed…. soooo.. this looks delish! I read your blog every day because you are what the voice in my head sounds like. A. This recipe sounds amazing. B. Ryan Gosling drenched in brown butter sounds even MORE amazing. C. Eating this recipe while watching Ryan Gosling being drenched in brown butter is way too much for me to handle! How about Ryan Gosling….oh, never mind…what I’m thinking is really just way too much to take….HA! I love love love your photos as well. Can you tell me which camera you use? I’m looking to upgrade my Canon digicam soon. I want to eat this salad. I love roasted veggies and bread chunks in salads! So good. You seriously crack me up. Apparantly your life IS interesting because I’m on your site EVERY day. What does that say about me???? this looks delectable. just saying, i sorta kinda need this in my belly right now. writing a research paper and dreaming of food (like this) is pretty typical for me. maybe now you understand why i tend to stay home on weekends and drink wine by myself and eat chocolate bars. just sayin. Wow – I LOVE panzanella salad and that you adjusted it for fall is BRILLIANT! I love your take on panzanella – looks like a perfect autumn dish. Great post. I AM Italian and I agree…panzella salad is pretty rockin. Check Barefoot Contessa for a super traditional recipe – I serve it a lot with BBQ steak or ribs in the summer. But this looks really good and I’m planning on making it tomorrow night for the “adults” at the neighborhood Halloween party. Thanks! My husband and I tried the Autumn Mac and Cheese last night…DELICIOUS! He said it was one of the best dinners I have made. Thank you for the recipe! 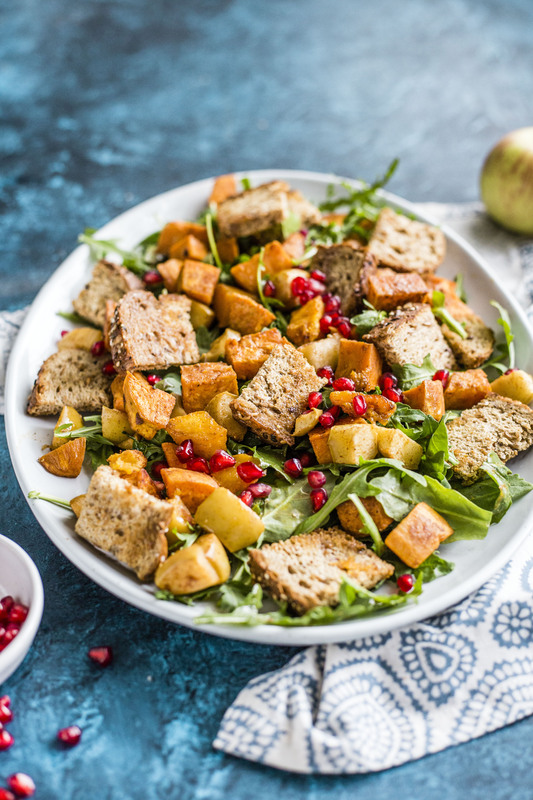 Pingback: Roasted Autumn Panzanella Salad with Spiced Pomegranate … | Salat rezepte. This was delicious! A wonderful panzanella salad that I will definitely be remaking it again and again! Love the beautiful pictures. I just used the butternut squash, not the sweet potatoes and the flavor was still full and tasty. Pingback: Thanksgiving Food, Decor & Family! Nice panza…only 45 minutes is much to long for the squash and sweet potato!!! I achieved a much better result with 20 minutes.